If there is one word that Greeks seldom ever us it is Greeks, except when they are talking to foreigners. They certainly never use the word Greeks to describe themselves. The modern English noun Greek is derived from the Latin Graeci, which in turn has its origins in the Ancient Greek Γραικός (Graikós). The word may be related to the Greek word γέρων (géron), ‘old man’ – which also gives us the word gerontology and geriatric. When Aristotle uses the term Graikos and relates it to Hellenes (Meteorologica I xiv), he claims it was the name originally used by the Illyrians for the Dorians in Epirus from Graii, a native name of the people of Epirus. But when Greeks are talking about themselves today they use either the word Ἕλληνες (Héllēnes) or the word Ρωμαίοι Romoi. In Captain Corelli’s Mandolin, Louis de Bernieres explores the conflict between the Greek concepts of Hellene and Romoi. Whichever self-description they prefer, Greeks share a common pride in their nationality. 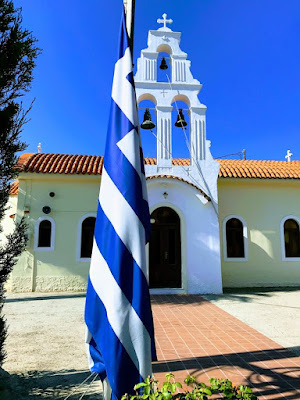 Greek flags fly everywhere, houses, doors, and even café tables and chairs, are decked out in the national blue and white as a sign not so much of aggressive nationalism but of cultural confidence. Pan-Hellenic unity was promoted at religious festivals and the four Panhellenic Games, including the Olympic Games. From the Middle Ages and throughout Ottoman rule, Greeks were known by the names Ῥωμαῖοι (Romaioi) and Ρωμιοί (Romioi) in the plural, and Ῥωμαῖoς (Romaios) or Ρωμιός (Romiós) in the singular. These names originally signified the inhabitants of the city of Rome, but as Roman citizenship was extended throughout the Roman Empire to Greeks and others, it soon lost its connection with the Latins. Eventually, the word Romaios came to mean the Hellenised inhabitants of the East Roman Empire, indicating citizenship rather than descent, so that the historian Procopius refers to the Byzantines as Hellenised Romans. When Charlemagne was crowned the Roman Emperor by the Pope in 800, a war of names about the New Rome revolved around claims to Roman imperial rights in the West and in Constantinople, with the Byzantines claiming the Roman name (Ῥωμαῖος). The name Hellene had come to imply paganism, but it was revived in the ninth century when paganism was no longer a threat to Christianity, and Greeks came to distinguish between Hellenes and Latins. On the eve of the Fall of Constantinople, the Last Emperor urged his soldiers to remember that they were the descendants of Greeks and Romans. After the Ottoman conquest of Constantinople and during the struggle for independence, there were strong ideological divisions over the three competing national names of the Greeks. The majority of people, especially those in rural areas, still perceived themselves as having a Romios or Roman identity, as heirs to the Byzantine Empire. The absence of a Byzantine state gradually led to the marginalisation of the Roman name and allowed Hellene (Ἕλλην) to resurface as the primary national name. Theodoros Kolokotronis, for example, made a point of always addressing his revolutionary troops as Hellenes. The new Greek state established in the 19th century did not include Crete, Thessaly, Epirus, Macedonia, the Ionian Islands and many parts of Asia Minor with large Greek-speaking and Orthodox communities, and most emotionally it did not include Constantinople. The new state did not include the entire Hellenic nation, but its citizens were called Hellenes, although less than one-third of the Greek population of the Ottoman Empire was now living within the borders of the new Greek state. The nation was regarded as all the Hellenes (Hellenic men) and Hellenides (Hellenic women) living in the kingdom of Greece and those living in the Ottoman Empire. The Hellenes themselves decided twice that they did not want a monarchy – once in 1924, and again in 1974 in a 69-31 vote in a referendum, with many Greeks convinced that Constantine II had given a veneer of legitimacy to the colonels’ regime from 1967 to 1973. Today, in some social situations Greeks can react negatively or be offended if the word Γραικός (Graikós) where the word Έλληνας (Hellenas) is the right word to use. But claims by a junior branch of the Danish royal family are responded to with even greater negativity by the majority of Hellenes.